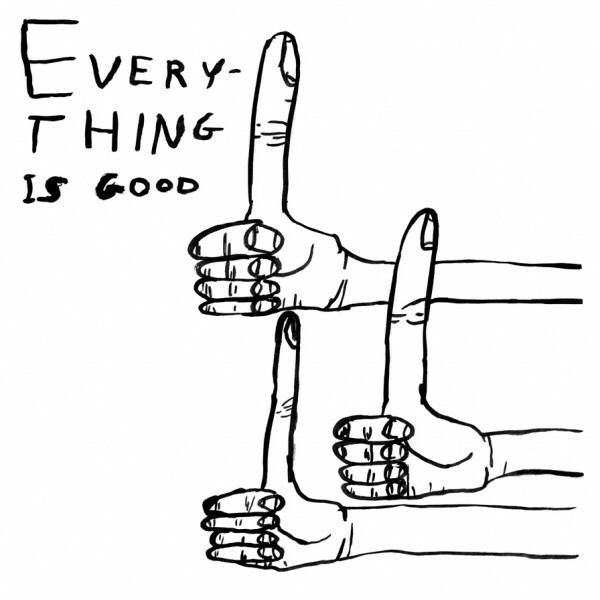 After the very outward-looking Deller exhibition which dealt primarily with culture and society, I immediately climbed the stairs of the Hayward gallery and stepped straight out of the real world and into the eccentric brain of David Shrigley. It felt completely fitting that the show was in the top space, as if a visual representation of being inside his mind. Deliberate? I hope so. The first thing I noticed as I came into the room was the eclectic nature of the pieces. Deller’s work had also seemed a multifarious assortment, but only in terms of material and style; the message and topic was generally consistent. 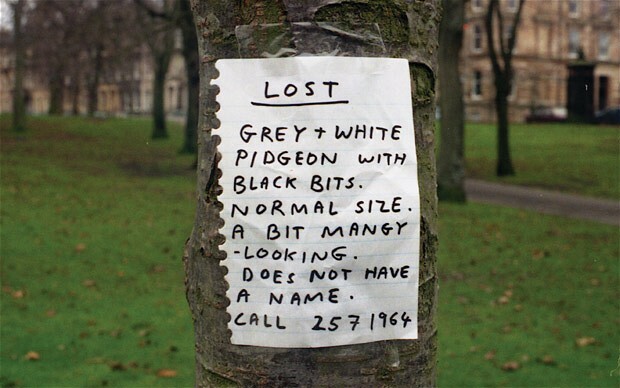 Like Deller, Shrigley’s objects also cover a range of techniques and approaches; some intervention, photographs, sculpture, video etc. But the message is convoluted. I accepted after a while that I was not going to ‘get it’, if indeed there was anything to get. That’s not to say i didn’t like it. 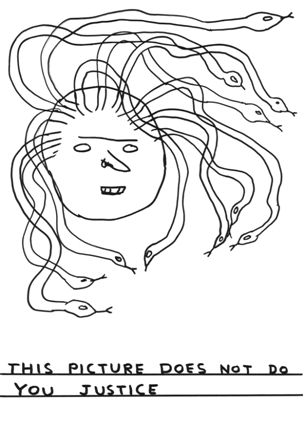 The contrast between Deller’s clear moral and political messages and the stream of consciousness-feel of Shrigley was like being electro-shocked from the frontal lobe to the neural networks (to continue the brain analogy). 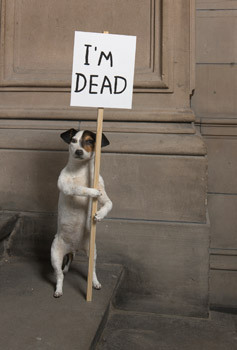 It’s clear that Shrigley has a dry sense of humour. 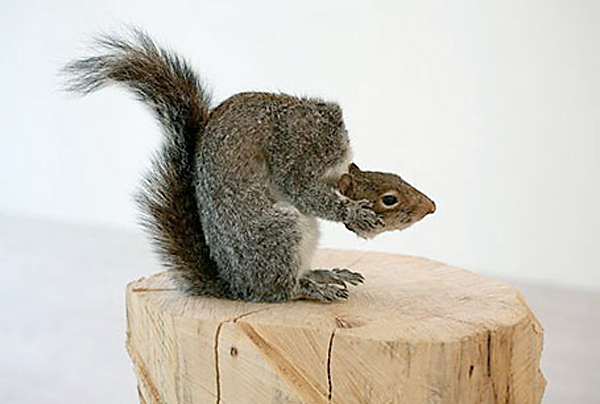 Again, much like Deller, his work makes you laugh – but not in the same way. 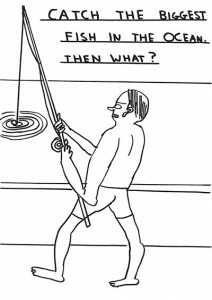 Deller’s humour was witty and sometimes withering. 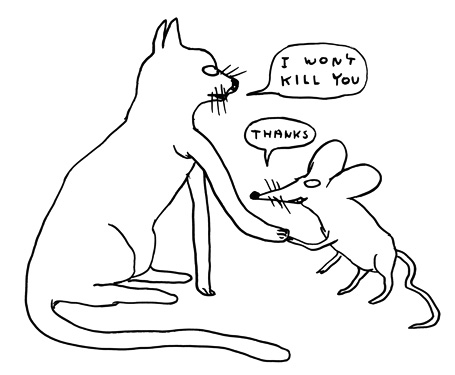 With Shrigley’s work, I laughed outwardly at the silliness, nervously at the creepiness, and sometimes hysterically at the madness. It’s fun in a disturbing kind of way. It reminds me vaguely of Beavis and Butthead. Not just in the graphic style, which has a similar spiky-featured look, but the general uneasiness of the vibe it emanates. Unsettling. As if the works will smile at you, then turn around and bite. His wall of sketches seems to be a kind of visual description of a manic episode. 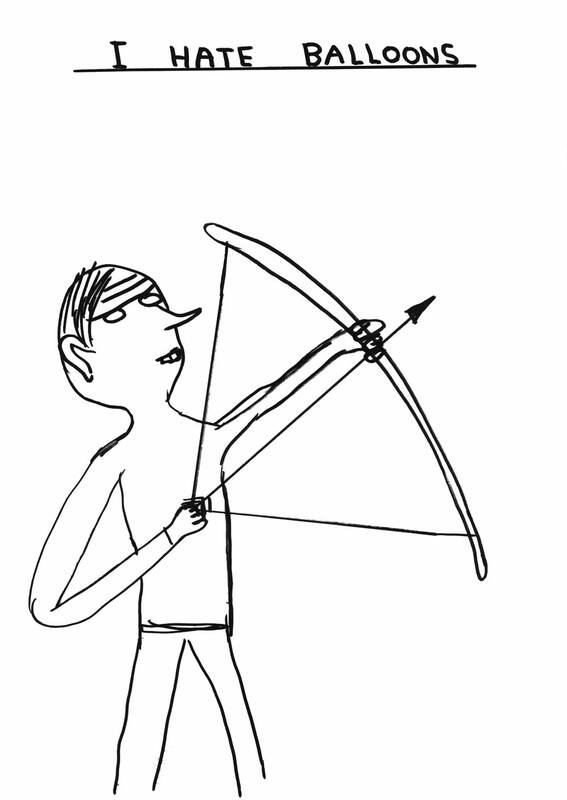 Your eyes jump from one drawing to another, trying to find a common link ,a story, but none appears. Maybe I’m just not imaginative enough to spot the connections. 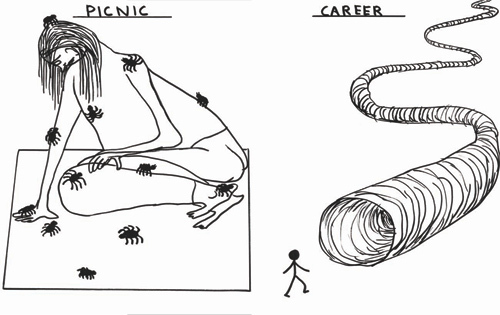 Or maybe there is no defined link and it is indeed just the rambling bizarre thoughts of Mr Shrigley himself. I like that I don’t know. I succeeded in drawing some meaning from his ‘Eggs’ piece as well as ‘New Friends’, both of which seemed to explore ideas about being different and fitting in. 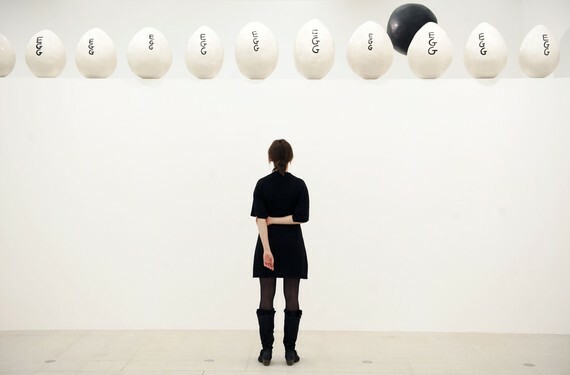 A line of irregular, oversized eggs were placed above one of the spaces, each emblazoned with the name ‘egg’. To me, it spoke of difference and similarity, acceptance and humanity (and animality). Apologies, a bit of alliteration overkill there. 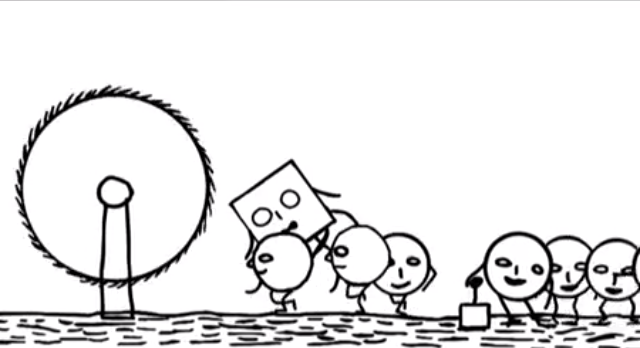 This message, about essentially being the same but with slight differences, was continued in the animated ‘New friends’ whereby a square character is cheered and held aloft by a large group of circular characters, but, thinking he is accepted, is then rounded off on a plane to become just like the rest. An animated morality tale of intolerance. Now I wouldn’t say I took anything in particular away with me from this exhibition (besides a generally bemused demeanor) but it was certainly a surreal experience. 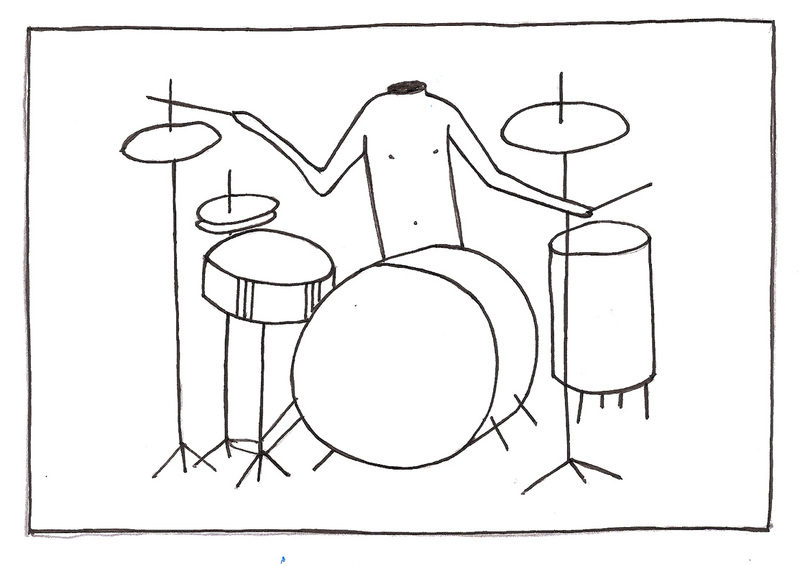 Finished up by the ultra-dry ‘I’m Dead’ dog and the ‘headless drummer’ animation, to which the gallery guide was gleefully tapping away on his thighs, I couldn’t help thinking that David Shrigley seems to me the art world equivalent of a cross between Woody Allen and the Coen Brothers. A man with an intellectual, manic sense of humour suffused with dark, inter-woven threads of meaning. His portfolio is so diverse I feel that this barely scratches the surface, but I think that the urge to scratch deeper has only just begun. Hi! I found your blog through the Camberwell show review. I want to thank you for coming, but specially for sharing the wonderful reviews you write. I’m absolutely delighted reading your stuff. Thanks a lot for sharing!